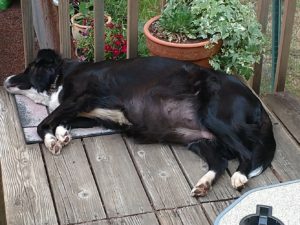 Latest News – Who's A Good Dog? Just a brief note to touch base. I can’t believe I have not posted since last year. Let’s just say life gave us fantastic mountains to climb….and we did it with much organization, cooperation and great friends! 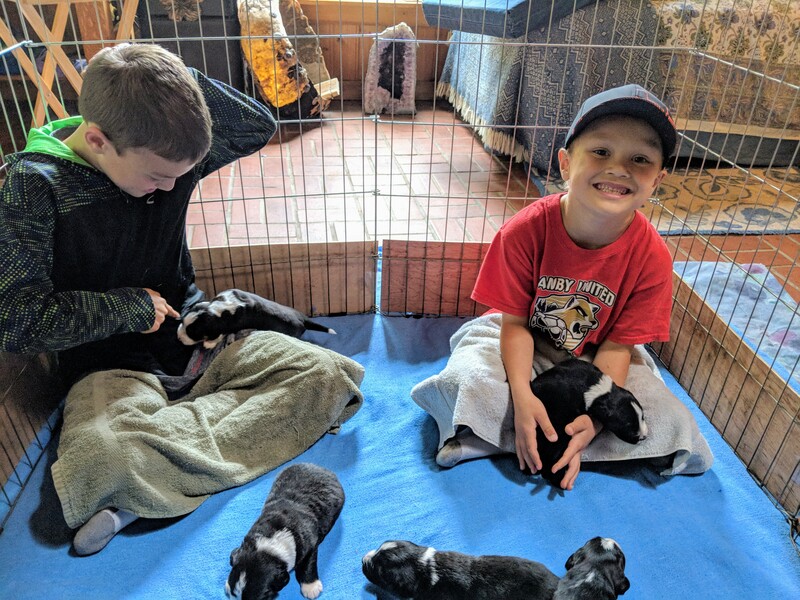 First you should know, all the puppies went to wonderful homes with incredible families before the 8 weeks were up. We couldn’t be happier about that. I will post some pics about the wrap-up later to share the beauty. You recall my work with Zimbabwe? Well, the last day of the 8th week as we were sending home puppy number 10, the packing began and we were out the door to the Zimbabwe Music Festival within 24 hours, where Ancient Ways raises awareness and funds for the work with the preschool, wells, and maturing girls. Breeze did great and didn’t bat an eye by all the changes. From there the year continued with the same pace and intensity…not much of a lull. Finally with 2019, I’ve been working on taxes, for myself and Ancient Ways, with every spare moment (I clearly wear too many hats). And here it is March…almost got them out the door! We skipped a cycle for Breeze and she appears to have some hormones starting up for being bred again within 6-8 weeks. We are planning a pairing with Ben as his last two litters have been very sweet. 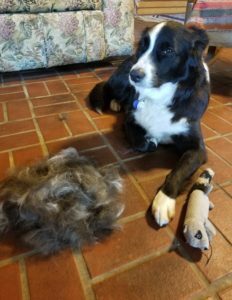 She is currently “blowing her coat”, meaning a major shedding. She began during the snow storms so I know it isn’t this nice weather we are having this week. Normally she doesn’t shed much at all! Relaxing after a quick brushing! Yes, that is a pile of fur. This means she might be bred by mid-May with puppies mid-July. I had originally been projecting sometime August. Summertime in general is a great time to be able to let the puppies explore so much nature and opportunity. They can far more easily get outside, often meaning training is superior (December is a tough month to go outside regularly). They go home 8 weeks after birth. We have been taking deposits for her litter. 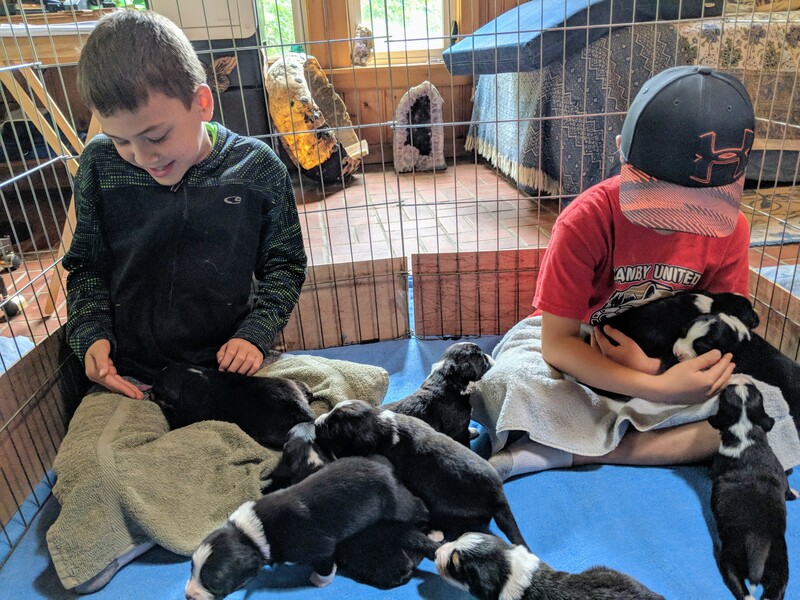 Hopefully the difference of getting a pup a few weeks earlier will not be a problem for any of you who were listening to my earlier projections. Its good to get a place on the list if you are serious. It assures you of your preferences. 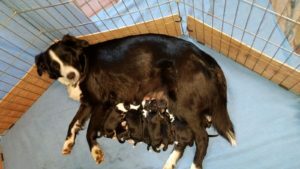 Her first litter was 7 puppies, then 12, then 10, so we are assuming she will be somewhere in that ballpark. If you are interested in one of Breeze’s next pups, please email me at contactme@jaiaenbeck.com and we can talk about your family’s needs for a life-long companion. Looking forward to hearing from you! Virgin Voyage – What an Adventure! Oh Boy! We are Going Outside! We are so excited – Mom told us all about it! You aren’t getting me…I mean reeeeaaaly excited! Actually, Breeze has this wonderful little stuffed toy, that during her labor of her first litter, she carried this little animal around the house and into her den, as if it were a puppy. So in the last day or so, as we have begun discussing taking the pups outside, she has all of a sudden started taking this stuffed toy outside! Its like she is agreeing with us, that they need to get out there and get a handle on the world. Funny…we are all so tuned in to each other! They aren’t quite big enough to climb over the fencing door jam. And, the ramp was like a slide! although this day, we didn’t make it all the way to the ground. We also weighed and wormed. Clearly Breeze has plenty of milk to share. the one girl (shown below) is slightly lighter but super healthy. Pups all settled in quickly as we came back inside. Wow – these days are moving along so quickly! Marimba class brought in a few visitors. Whoops this isn’t a pup…Bullwinkle? Day 19 was a big visitor day! Life is good and the pups are great. Please bear with my slowness to upload pics. Summer demands are over the top this year. So here are the first 2 weeks in one post. This little one was wandering around a full minute before the video starts. …reminds me of my habits, returning to what is familiar. After the boys left everyone fell asleep…a big day on campus. Today was the first day their eyes were really open! It was most obvious when I went to change the sheets. Today they would not be contained easily and were walking all over. This little guy was off sleeping by himself. so we will be watching this little one – does he hang out solo a lot? so it starts early by observing the strange, rare and peculiar! Please write or call and make an appointment to come play with the puppies! Breeze and all enjoy it immensely! We have some exciting movies to watch. Granted it may not compete with Netflix etc. but they are home grown and educational (if you like to know the rest of the story). This is really delightful to get to share with you. I don’t know that its popcorn-worthy but its very interesting if you have not been present at the birth of puppies. For some reason Breeze unexpectedly and repeatedly insisted on moving her first pup out of the den, which would be a real problem for clean up. So, we had to put up fabric so she couldn’t see us, and then she settled down, and stayed inside without a problem. Last litter she had also tried to move the first pup to the futon. We waited a healthy hour for pup #2. During that time Breeze just hung out and panted, also taking care of #1. I like this film even though its very dark. Its so tender. The silhouette effect satisfies my inner artist. 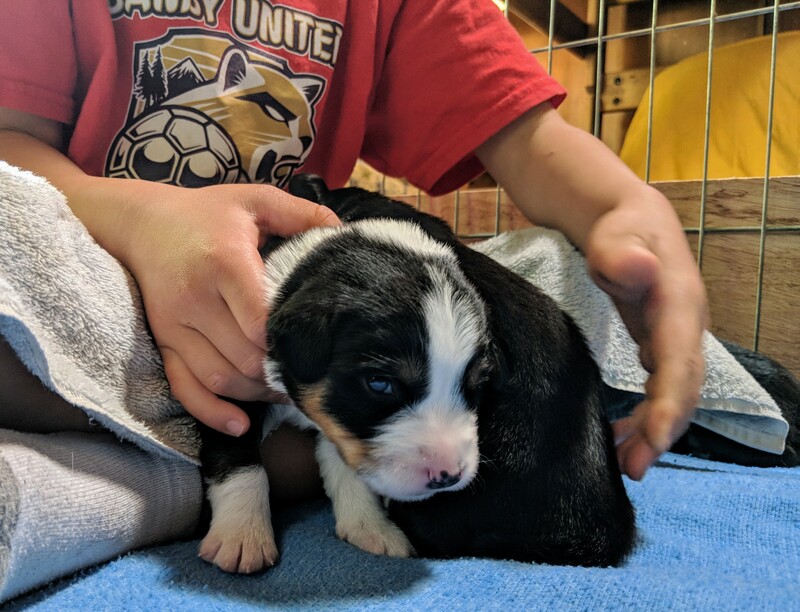 2nd born is a tri-color male. Breeze is taking care of the umbilical cord nicely. This is #6 on the right with#5 on Breeze’s nose … you can barely see #5’s tri-color cheek. Often the brown evolves and become darker as time goes on, so watching them grow is like opening a treasure box. #6 is the pup on her leg, finding a nice resting place. #7 is the last of the boys….what a run of males! #8 is the 1st girl! Are these kittens or puppies? There are 8 of them, whatever they are. #9 has arrived and is a girl! Are there any more coming? Patiently waiting the 2 hours for their last sibling. And yes, we get dew claws removed, but so far have never had any. Day Zero went extremely well, thanks to all hands on deck! From about 3 pm Wednesday Breeze began the panting that says “hey, we are with the program now!”. With 3 different buddies taking shifts from yesterday evening until tonight (thanks Amy, Helen and Renee! ), we all jumped through the whelping hoops with flying colors! I am only somewhat on Neptune and Breeze is soooo relaxed. 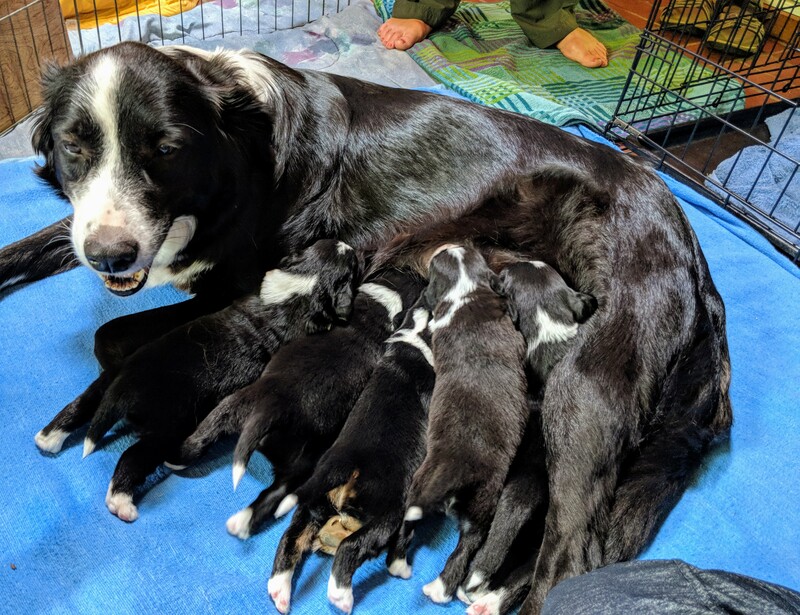 Ben and Breeze’s 2018 litter is beautiful! We have 7 males who all came first, and 3 females who followed. 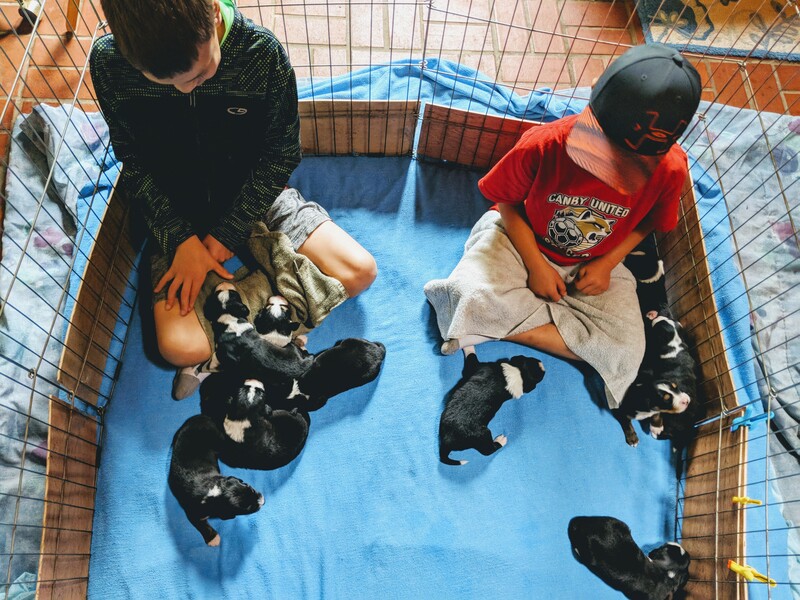 They began at 12:30 pm today with the very first pup, and 1 hour later it was every 10-15 minutes or so. Then there was a pause for another hour, a 10 minute pup, and finally the very last one waited 2 hours before coming! We hung out for quite a while thinking there might be one more, but called it around 8 pm. There are 6 black and whites (traditional Irish) and 4 tri-color like their papa Ben (black, tan, and white). 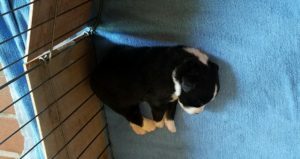 1 girl is a tri-color and the other 2 are black and white. All pups came into the world without a hitch. Everyone is resting so calmly, and nestling in for a good night. I will be doing the same earlier than usual, as last night’s panting was not conducive to sleep. Breeze and I spent the night on the floor in and next to her den. I think after a brief swim and giving Breeze a walk, I too will be going into the horizontal zone. I have so many pictures and videos of the event, since all the off-shift helpers were present in spirit and needed to stay in the loop, so I probably over documented the whole thing. I’ll need to pare it down and send out a few here tomorrow. Sorry I’m too bushed tonight to pull something out. Payton is the official pool-meister so I’ll need her official comment, but if I understand how it works (I’m a virgin pooler) I think Kathy won (she is just so intuitive)! She got 3 out of 5! She had it with 7 males, first one born in the a.m. on 6/7! More manana! Thanks much for your interest! Okay I’m not going to be excessive here and give you hourly reports, but I do want to say that things are getting serious around here. This is a picture of yesterday evening…she was still able to lay around and be comfortable. This after noon that changed into the pre-labor panting, which looks like labor but isn’t quite as intense. Its very different than the previous days. With the warm weather its been an interesting process to decipher. Breeze is 83″ around the largest part of her middle. She seems so much bigger than before, so to get a measurement seems like a good thing to have in our records. So a good guess might be the wee hours of the morning or later Thursday a.m. I don’t know who besides me had Thursday in the puppy pool but that is the way its headed…a remote possibility could be midnight tonight?